If you live in the US, you’re reading this on May 31, the last day of my 365 challenge. Ah, let’s all say that together, “365 Days of decluttering.” Sounds nice, doesn’t it? How did I get to this point? What have I gotten rid of? What have I learned? In 2002, my family of a 2 1/2 year old daughter, husband and I bought a well used house in a very nice neighborhood. An 86 year old widower lived in the house, which hadn’t been remodelled or updated in dozens of years. You can use your imagination! Within 3 months, we had another daughter. With these two ever-changing beings scampering around underfoot, we took on two major remodels with Dan and I providing a lot, but certainly not all, of the labor. In addition, Dan worked full time, and I had the kids home with me. In the summer of 2009, we finished our second major remodel, which included the kitchen, all the living/eating areas, and the addition of a room and bath on the second floor. When the workers finished, they left behind a beautiful, mostly completed home. It needed paint everywhere, inside and out, plus clean up in the yard, but it was beautiful. Absolutely beautiful. I looked around at all our junk spread everywhere in the house and knew I could no longer use “I don’t know where it goes” as an excuse. The remodelling was done; everything had to have a home. I started working on it on my own. I got my friend Holly to help me out a couple of times. I hired Susan and Amy from The Clutter Consultants to help me a couple of times. But it was slow going because I was also painting when I had a block of free time. Then at the very end of May 2010, my friend Janet sent me a link to Unclutterer. From there I found 365 Less Things. I said, “I can take that challenge,” and I started the next day, not only decluttering but holding myself accountable by noting what I had decluttered everyday as one of my Facebook posts. It took a couple of months before others could really see a difference, but the successes kept building on themselves. As the months progressed, I heard from friends that they were inspired by me, and once I read on Facebook, “Inspired by my friend Cindy today I decluttered…” People asked me for tips on how to get rid of things and wondered how to sell on Ebay. In August 2010, Colleen planned a month-long trip to Italy with Steve, and she began looking for people who would write guest columns to help fill up the space. I wrote six, and I think two other people wrote one each. (Can you imagine that she prepared the rest of the 30 days by herself?) You can read my first post here. The at the end of October when Colleen’s son Liam was hospitalized after a serious accident, I got an email from Colleen: Could I please try to keep the blog running while she was at the hospital? Well, of course I could. When Liam was healed and home, I continued to write once a week what is now called Cindy’s Weekly Wisdom. In the past year, I have decluttered 2316 items and have made $2635.70 (1868 Euros, 2493 Australian dollars). The smallest things I have decluttered have been all the little scraps of art junk generated by my children. None of the items I decluttered were especially wrenching for me, and my only regret was the cracking (but not yet broken) lid for a 13 x 9 pan. I wish I’d saved until until it did completely break. My house was a constant mess. If I can get control of mine, you can get control of yours. If you declutter, your friends, relatives, children and spouse will follow, but at their own pace and in their own time. Letting go of something, or lots of somethings, probably won’t be as wrenching as you anticipate. Your house will practically self-clean when you reach a certain mass of decluttered items. Decluttering is never completely done. It’s a form of housekeeping, and it has to be maintained. I decided that 365 days felt rather anticlimactic for me. It represents a completion of an assigned number of days, but I am not through. I decided to extend my challenge to the end of the year, another 6 months. I’ll re-evaluate if I can go into maintenance mode then, but for now, there’s still plenty of work to be done. Cindy wrote about freebies the other day and how they often just end up as clutter. 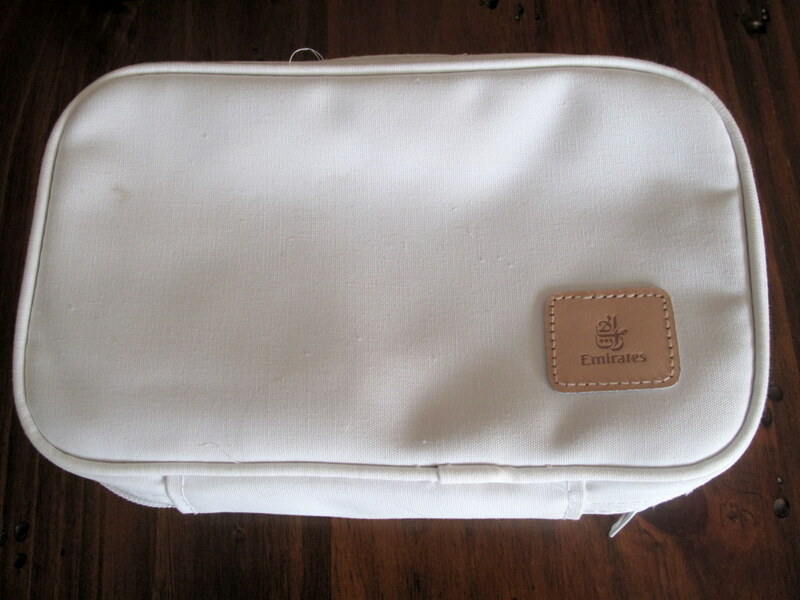 This toiletries bag is one of those free clutter items and it was full of free product as well. It seemed like such a novelty at the time but it didn’t take long to figure out that mostly it was just a blight on the environment. All those tiny products in little plastic bottles with no recycling code on them what a waste. i have learned my lesson. Something that made me laugh ~ My friend Amber and I discussing the idea of starting a café critic blog together. We were just joking of course but we had fun discussing the details or our imagined escapades trying out all the different cafés in town and giving our “expert” opinion on their offerings. Something Awesome ~ That just cleaned look when you have finished vacuuming and wiping out the interior of your car. Tip:- never by a car with a dark interior. Something to be grateful for ~ Having the car for a few days in a row. I am getting so much stuff done, including cleaning it. Something that made me happy ~ The joy of helping out a friend in need. Something that felt good ~ Crossing things off my to-do list. Cindy, Congratulations on your 365 days. I know you feel really free compared to before. I like that you are going to continue with it. I think you will find that there will always be items to be decluttered. Maybe not every day but probably a few a week. Thank you Deb. For right now, there’s plenty I can keep decluttering at an item a day. I know there are areas of the house that need to be visited / revisited, and the garage and side yard are challenges waiting to be conquered. Congratulations Cindy on how far you have come in your journey. It is so freeing to let go of all the excess stuff and it is so true how easy it is to clean once there is less stuff. Thank you Natalie. Even when I’m in maintenance mode, I’m sure I’ll still be writing; I enjoy it too much to quit. Now it is my turn to congratulate you on your journey and amazing progress!!! I was amazed by your post! I am also really glad that you write here, because you also have words of wisdom and encouragement to all of us readers. As for selling stuff, it is good to make a few bucks and I am not against thrift stores or second hand shops. I have sold books to used bookshops. I am against my husband wanting to sell anything, because he never will, 😀 😀 😀 :-D. So let’s keep our home clean and organised and motivating each other. Thank you, thank you, thank you. I decided that I want to pay off our mortgage early and also decided, very recently, that I would put every penny that I earn through selling toward our mortgage. You can image that had a strong re-energizing affect on me! Oh, this is so amazing! I was just looking through the cabinet under my sink this morning and wondering what the heck to do with all those little bottles! Today’s declutter item for me was the bottom half of a cookie jar that a neighbor pawned off on me at a yard sale. I pulled it out and need to take it back over to her. It’s her junk, not mine and I think I should offer it back to her before either junking it or donating it. But I was thinking that I need to do something with those toiletries and I also have a toiletries bag on the floor in the basement I saw today that I need to get rid of. So what did you do with the bag and whatever was inside of it? And great post Cindy and congratulations on your 365 days! I’m sure once you get into the habit of getting rid of unneeded things, you stop counting eventually! I donated the bag to the thrift shop and I used up the contents. We have this thing called Natural Progression Decluttering here at 365lessthings. Check out the link I left there for you and you will understand what that is all about. We have had the odd “Use It Up” Challenge here at 365lessthings also. If you want to find out more about this subject just type Use It Up or Natural Progression into the search bar on the right hand side of my home page. cindy, it was such a pleasure to read this post. very very encouraging. BTW, please remember that your local homeless shelter can usually use those kind of toiletries if you have somehow ended up with them. Thank you Rachel. I know you’ve have “stuff all over the surfaces” syndrome, too, and you CAN deal with it – one item at a time, just like I did. Go Rachel, go! Hurray for you, Cindy! I am so happy for you–more than 2,000 items decluttered! Now that school is out here for me (tomorrow), I’ll be back in declutter mode as I have been in maintenance mode for a couple of months. I loved your husband’s wisdom–much like what my hubby would say. I’ll read it to him. Colleen–I enjoyed your faves today, especially the one about the cafe blog–I’ll volunteer to do guest posts from here on ALL my local coffee places~lol! Thank you Willow. The number of items decluttered make me wonder how many items I own. Tens of thousands I would guess. That seem absolutely amazing, doesn’t it. I tried to search “How many items does the average American own” and came up with nothing. I guess there are some questions that even Google can’t help you with. congratulation and thank you for hanging out with me here and contributing to my blog over the last year. I remember when you first starting commenting, here is your first ever comment. Do you know that there are 349 pages of comments archived here at 365lessthings and 29 of those pages are from you alone. That is a lot considering about half of the 349 would be my responses to the comments so you own 29 of the remaining 175 pages. I remember the burden you removed from my shoulders when you were so enthusiastic to write some posts for me when I needed to fill my vacation dates with posts before I left. And oh how I remember the relief and breathing space you gifted me with when Liam had his accident. Here is the comment you left for the readers when I asked you to step in for me. I thank you from the bottom of my heart for both those times. And of course I thank you for writing Cindy’s Words of Wisdom every week as it lightens my load and gives the readers a different perspective. It is very time consuming writing a blog post 5 days of the week and answering all the comments that ensue. Ten minutes of decluttering a day is a very light task in comparison to keeping up with my blog commitments but they both bring me great pleasure so it is well worth my time. I also appreciate you being open enough to show the readers all those before and after shots of your not so tidy areas. Those photos have filled the Saturday spot many times over the last five months. And of course I have also, along with our readers, got to see the transition as you have gone from a women/mother/wife frustrated with your clutter to one freed from that weight of burden to the point where your beautiful newly renovated house has transformed into a wonderful stress free environment and a home to be proud of. We can all tell from your comments how much better that makes you feel and how much wiser you are about how to keep it that way. Congratulations again Cindy and I look forward to your company for some time yet. I LOVE it. Thank you so much Colleen for your kind words and for looking up my first comment. I’ve been chatting with you since 16 days into my 365 days! What would I have done without you and this blog? Probably not have been so successful or had as much fun getting to write once a week. Thank you for both Colleen. It has been entirely my pleasure. Sometimes I would like to have a start date too. Decluttering, minimalism and simplification are concepts that entered my life gradually. A few days ago I read an old diary in which i wrote about decluttering in 2004. Perhaps I should create a celebration day just for fun. I love your comment on regret. Even if you only feel sorry for one object. I often worry about it. Once I decluttered a DVD series. Half a year later I was very sorry about that. So I bought them again. It is a series that I look at when I am sentimental. I also regret that I threw away love letters. But I’ve stopped missing them now. Sarah, It is surprising how little I have missed. Years and years ago I threw away a bunch of photos. There is one I wish I’d kept, and I still think about it, but I know there were many dozens of others that got chucked that day, and I have no idea what they were. However, as we often say about memories and keeping things to remind you of people, trips, etc., the photo that I’m missing, which was from a camping trip, is emblazoned in my mind. I just wish I had it to show to others. It was a funny picture, but my guess is that my retelling of the events in the photo are probably far more amusing to others than the snap shot itself would be. So glad I discovered even if not till day 352. Chaos is beginning to rule in my house and you have given me hope. My hat is off to you for sticking to it for 365 days. You have done a wonderful job. Thank you. When I found the site, I went back and read from the beginning, but there were no where near 352 days then. I think it was more like 60. Good luck in your challenge. Ha! Glad my messes amuse you! Sometimes they amuse me too. actually I think my tidy streak didn’t start until I left home or at the very earliest once I started working retail where there is a place for everything and everything needs to be in its place or kaos reins. As a child my mother actually through all mine and my sisters mess out the window of our two story house and we had to go out a fetch it and tidy it all away. As for the decluttering, not the long term effective type like I do now but the short bursts started the first time my husband was transfered for his job after we had been married for six years. I soon learned that the less stuff you own the less stuff you have to get prepared for a removal. Now I am a neat freak, not obsessive though just systematic, and well, you know how my decluttering works these day. more long term effective rather than periodic. I am sure my mum must think “I wish she was like this when she lived at home”. I must admit though my parents were both very capable handy people and they certainly passed that down and one of my dad’s favourite expressions was “A job worth doing is worth doing well!”. Congratulations on your milestone, Cindy! I’ve very much enjoyed reading your posts too. I remember seeing on somebody’s blog–can’t remember now where it was–and it might be in a book–but all the household goods owned by a typical family in various countries were set outside their home and photographed. As you might imagine, people in the poorer countries had very few things. By the time the pictures got to an American household, you wouldn’t believe the piles and piles and piles of stuff that were photographed. Even though I can’t remember where to find that to post a link, the photos really made an impression on me, and are seared into my mind. Oh I’ve seen that book. I’ve also seen a similar one involving food – what people eat for a week around the world. I remember being surprised at how much packaged goods the Japanese ate. The American family, of course, was a pizza, soda, Cheese Doodles family. I guess selecting any one family to represent all of us is going to be inaccurrate. Ah spelling errors, that just means that you fit in with Colleen and me. That is a good quote. When I asked my 8 year old if she had anything to say, she looked at me and said, “No.” Ha ha. Not such a great quote. Congrats, Cindy–what an amazing number of things you’ve gotten rid of! I’m looking forward to seeing what else you’ll do in the next six month. Sounds like it will be a refinement process. About to get into another cleanout myself, to get rid of the things that remain from my last cleanout last fall. I’m one of those drastic action people, not so good with the one thing per day. I love this blog because I love reading about the details that you and Colleen tackle, and of course your writing styles are so engaging! Thank you Meg. I remember the photo on your blog of everything you dragged to the curb after one of your clean outs. There was a very nice lamp that I would have snapped up. I appreciate your compliment on my writing style. Finally, that degree in English is paying off! Hi Cindy – Sorry to be late! Just getting back to this post after being interrupted reading it the day it was posted … I just wanted to add my congratulations on keeping at this process. With your children at busy ages and you working now as well, it can’t have been easy to find the energy and time to be consistent and persistent, but you are doing it, and for that you need recognized and celebrated! I find it hard to get started sometimes, but much harder to continue, so I appreciate your example in this area. Glad you are going to continue to write for Colleen. And Colleen, what a lovely thank-you that was to Cindy.